For each chromosome, the total number of transcripts that are annotated in EnsEMBL is displayed. The chromosome is dividep up into 93 bins. If you click on one of the displayed bins, a new web browser window will pop up showing the selected genome region in EnsEMBL. 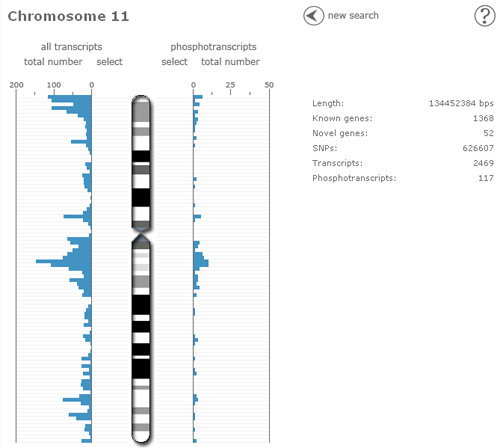 Furthermore, the number of identified gene transcripts is shown (to the right-hand side of the chromosome image). Therefore, one can directly compare the distributions of transcripts that are annotated in EnsEMBL and transcripts that have been identified via mass spectrometry in our lab. If you click on one of the bins that are linked to the number of measured transcripts, the identified gene transcripts that are located within the selected bin are listed. If you click on the corresponding EnsEMBL button, the EnsEMBL annotation of the chosen transcript will pop up (including the Mapu annotation on the basis of the DAS source system). In addition, some general statistics on the given chromosome such as length and number of SNPs are displayed.